Day 3. Initiate – I Am A Christian Communicator & Prayer Specialist. I am a Christian Communicator & Prayer Specialist. 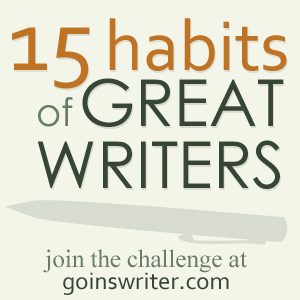 I am writing this for Day 3 of 15 Habits of Great Writers. On Day 3 we are getting personal, if we haven’t already by saying that we are all writers. What am I? Well for starters I am a Christian. It is an integral part of who I am, and I hope comes through in all that I do whether overtly Christian or not. What am I? Am I an author? Am I a blogger? Am I a tweep? I would say that I am a communicator, in that I do not want to limit myself to any one platform, or type of media. People have different learning styles, and to engage with everyone I will need to engage as many of their senses as possible, and some people will only learn by doing what they are learning. All forms of communication are equally valid, technology in itself is generally neutral (there are some exceptions), it can be used for good or for ill. How can I use Twitter or a blog to share my life and my faith? And how can I use the internet as a tool for growing prayer in the Kingdom of God. This is journey I am still exploring, and leads me onto my last statement about myself. I would class myself as a prayer specialist. What do I mean by this? I mean that for me prayer is at the heart of who and what I am. My longing is for Christians and the church, personally and corporately, to grow in prayer, as the two go hand in hand. I do not see a church in all its facets, I see it through one lens, that of prayer. If you ask a youthworker you would think the most important thing in church life would be the youthwork or lack thereof, and it would be quite rightly so as that is their area of responsibility and calling. That is how I am with prayer. I long to see churches grow in their prayer-lives and turn their prayer outwards with them advancing in Kingdom focused prayer, then they will find that God meets all their other needs as well. Well, ‘That’s me’ to quote the title of an Abba song. You can take me or leave me, that is up to you, but I am me. I will not apologise for what I am, as that is what God has made me. I am still growing, and I will only worry if ever I feel that I no longer need to grow. Until then I am on a journey, a pilgrimage to a better place because of my relationship with the Author and Creator of all things, with God himself. Day 1. Declaration – I Am A Writer. I have been since I wrote a fantastic story in first year senior school about an ancient ruined city and the volcano Popocatépetl which had an explosive finish as I recall! I forgot it for a while when I got distracted by theoretical physics, but that should have been an aside, not the main focus. I started to write again when I became a Christian, but only recently have had the confidence to refer to myself as the WRITER that I have been all along. I declared it on Twitter to @richard_tea who is also taking part by simply referring to him as a ‘fellow writer’, as I am one I do not need to be apologetic about it! Within an hour a fellow tweep asked me if I had ‘ever thought’ about writing my testimony for him to read on the breakfast show on UCB UK. I am a writer, as I say in my Twitter profile, so I had better get to work! The psalmist’s deliverance and honour ‘rests’ on God. Resting here suggests to me complete reliance upon, and dependence in. It is like having all your eggs in one basket, in God, nowhere else. As Christians we are to live from a place of rest in God, not of striving to reach a place of rest. We cannot be saved from our sins by striving, or be baptised in the Holy Spirit by striving. Those things only happen by the grace of God, so we need to rest in and trust him in all things. I can definitely say that I agree with this. Jesus delivered me from my sins when I came to know him. He has delivered me from attacks of the enemy over the years and also very recently. I know that I can trust him to do it because he is able! My honour also rests in him alone, the way that God has made some introductions recently (via Twitter) is really amazing. We should never apologise for being ourselves, but should try to be who God has called us to be. As long as we do this we can leave the rest to him and God will ‘exalt you in due time’ (1 Peter 5:6 NRSV). God is the mighty rock, the bedrock, on which we stand – Jesus is that bedrock. My refuge is also in him, regardless of whatever else is happening I can always run to him for safety and security. Father God, thank you that all we need is in you. And thank you most of all for Jesus who did everything that we could not, so that we could enter into your rest. In his name we pray. Amen.